It’s that time of the year again. The 2019 Easter Jeep Safari is taking place from April 13 – April 21, and tickets to attend the event are nearly sold out. As always, the event is filled with activities and things to do with other Jeepers, but many attendees go there for the merchants and their custom gear. Every year, one of the main events for any Jeep® at Easter Jeep Safari is the debut of concepts by Jeep and Mopar designed specifically for the event. Whether any of them will ever go into production is anyone’s guess but check out what Jeep and Mopar is bringing this year. What started in Moab, Utah in 1967 by the Moab Chamber of Commerce as a one-day trail ride has exploded over the years to encompass a little over a week’s worth of activities and trips. Today, the Easter Jeep Safari consists of trail rides, most of which will be daylong trips, all departing from Moab, Utah, throughout the nine-day-long event. With the Easter season also in tow (pun intended), “Big Saturday” is known as the culmination of Easter Jeep Safari on the Saturday of Easter weekend. With so much to look forward to, we’re splitting this into two parts. Let’s see how some of the new 2019 concepts compete with those of 2018 Easter Jeep Safari. 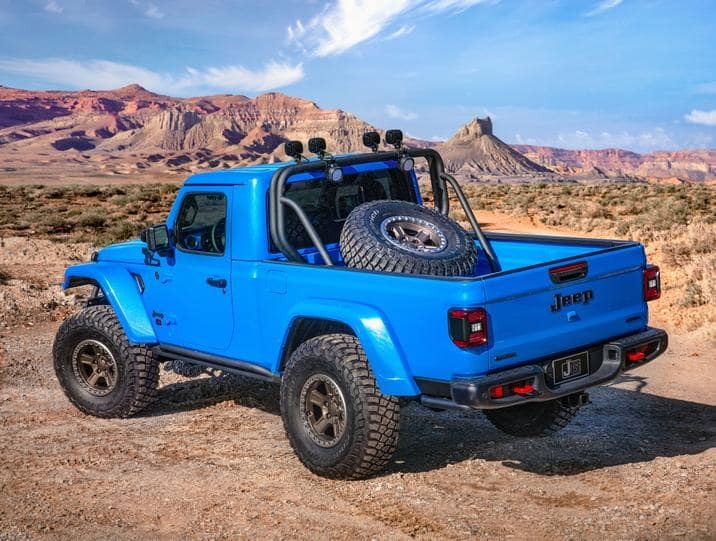 It shouldn’t be a surprise, but with the 2020 Jeep Gladiator and how quickly the Gladiator Launch Edition sold out, all of the concepts are based on the Jeep Gladiator. This first concept is a perfect mix of Jeep style with the original 1970 model and Mopar performance parts. The Rubicon two-door model of the Gladiator has been used for the Jeep J6, optimizing cargo space with a six-foot bed box that has been modified to be a whole foot longer than the standard Gladiator truck bed. Could this be a glimpse of configurations available or is it straight from Mopar? The overall length of the J6 is 201 inches, and the wheelbase clocks in at 118.4 inches, matching the wheelbase of the current-generation Jeep Wrangler 4-door model. 1970 style is most apparent with the custom Metallic Brilliant Blue paint job, paying homage to the exterior styling of the 1978 Jeep Honcho model. The truck bed comes with a body-color matching spray-in bedliner to keep the style blended all throughout. A production Jeep Performance Parts two-inch lift kit and 37-inch tires add extra trail clearance, and a prototype two-inch steel stinger bar that bolts onto the front bumper of the Rubicon and rock rails customized with two-inch steel tubes welded onto the Gladiator rails have been added. Some helpful features for going off-road include a two-and-a-quarter-inch steel prototype sport/roll bar planted in the bed carries a set of four, five-inch Jeep Performance Parts LED lights, four more LEDs that can be mounted on the aforementioned stinger bar, and two more on the A-pillars, for a total of ten to illuminate the trail ahead. These are controlled by an auxiliary switch bank inside the Jeep. Inside, the instrument panel inserts match the body color, and Katzkin leather with body-color blue stitching makes up the upholstery. The horn pad has been customized with a classic Jeep badge, matched with a bright pedal kit, all-weather floor mats and molded doorsill guards with the Jeep logo. A 3.6-liter engine is under the hood with a cold-air intake, and the trailer brake control switch allows the driver to tap into additional stopping power when towing. Also paying homage to Jeep heritage, the Scrambler was the first rumored name for the now Gladiator model, and sports the color palette and graphics of the iconic CJ Scrambler while making use of available Jeep Performance Parts. Also, like the J6, LEDs can be stationed atop the sport/roll bar and two on the vehicle’s A-pillars. Facing forward on the brush guard is another pair of seven-inch LED lights for increased illumination – all controlled by an auxiliary. Custom 17-inch slot wheels, a two-inch Jeep Performance Parts lift kit and 37-inch tires add onto the off-road spectacle. Heritage style shows with a recreation of the 1980s-era CJ8 Scrambler with a white exterior and amber-colored Freedom top roof. Punk’N Metallic Orange and Nacho body-side stripes running from the front panels to the bed with a matching hood graphic. Inside, Katzkin Amaretto Brown leather with orange stitching make up the upholstery, and the Jeep grille logo has been embroidered in a light Tungsten on the seatbacks. A Mopar bright pedal kit and all-weather floor mats finish the look. A Mopar cold-air intake and cat-back exhaust augment the 3.6-liter engine under the hood. 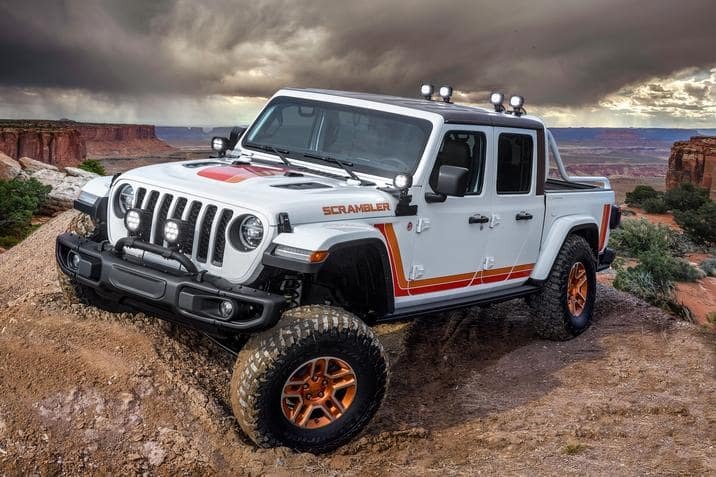 Made for more of that open-air feeling as well as going off-road, the rock-climber-themed Jeep Gladiator Gravity concept has been modified for greater heights. 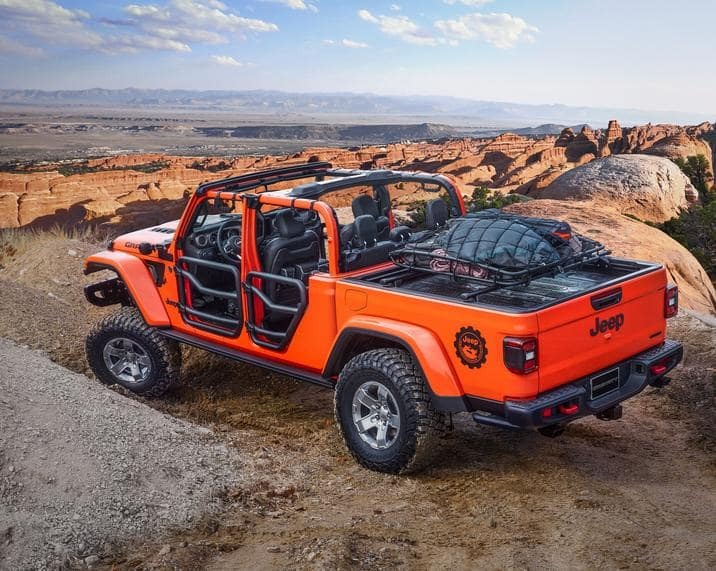 The entire exterior is bathed in the Punk’N Metallic Orange paint, really expressing the excitement of Jeep life, complemented by Jeep Performance Parts two-inch round steel tube doors, a mesh for when the top is down, and tie-down straps that secure the windshield when folded up. Again, we see the Jeep Performance Parts two-inch lift kit, along with 17-inch gear wheels wrapped in 35-inch tires for going off-road. Heavy-gauge steel Jeep Performance Parts rock rails have also been added. Storage has been enhanced in the truck bed with mounted Mopar cross rails work and a cargo carrier basket to deliver storage space for rock-climbing gear, such as ropes, helmets, etc. Similar to Ram with the RamBox, a unique Mopar bed storage system offers additional lockable cargo space through dual sliding drawers, while still allowing for storage on top in this Gladiator Easter Jeep Concept. Like the other two concepts, seven-inch LED lights to illuminate the path, along with help from five-inch LED lights on the A-pillars. For some performance, a cold-air intake and cat-back exhaust system were added to the powertrain. The interior gets Katzkin leather seats with the Jeep grille logo embroidered in Tungsten stitching. Adding to the off-road adventure, MOLLE (Modular Lightweight Load-carrying Equipment) bags for storage and all-weather floor mats with a unique “plug” system that allows for direct draining of water and debris were also added. Stick around for part two of the 2019 Easter Jeep Safari concepts. Follow Aventura Chrysler Jeep Dodge Ram social media and tell us your favorite.